FD er nok den bedste fairway driver i nyere tid. Den er stabil, pålidelig og kan tåle et kraftigt kast. Don't miss out on the first signature series release of Discmania's rising star Nate Perkins! The desert is one to be reckoned with. The heat is ruthless by day and the bitter cold is stunning by night. In a climate so extreme, only those with strength survive. It is home to specific slithering serpent. It gets its energy from basking under the sun only to twist, meander, and glimmer through the night. 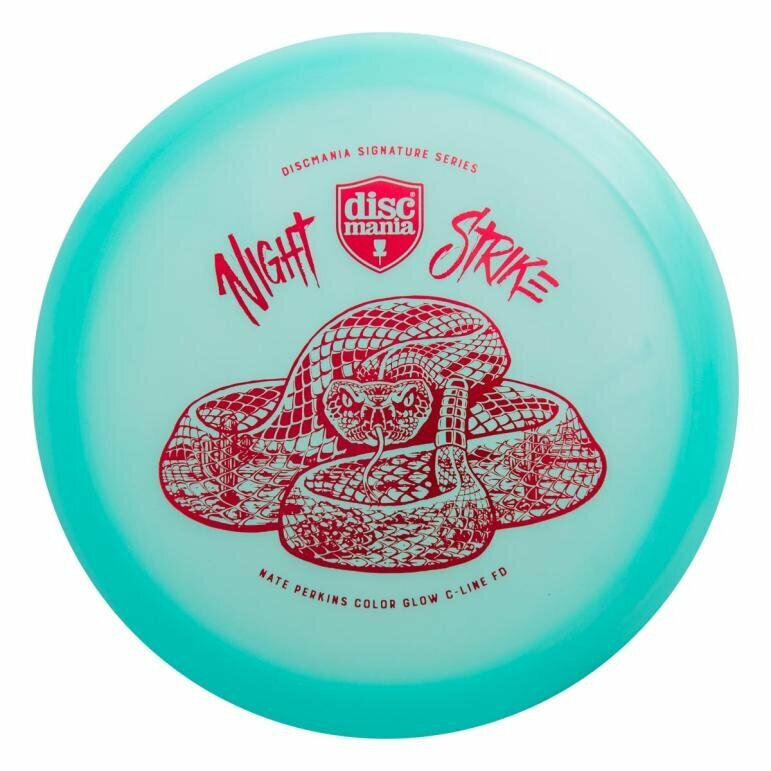 This is the Nate Perkins Color Glow C-line FD Night Strike! The Discmania FD is essential to all players. It is so versatile that it is claimed as the best fairway driver on the market. As a speed seven disc, the FD falls in the middle of almost all disc speeds. With a trusty flight, the consistency of this disc is essential to all players bags. It is comfortable in the hand, feels fast, and it has a ton of glide. It is perfect for hyzer flip, turn over, roller, and tailwind shots. The Colour Glow C-FD settles at the least stable of the FD spectrum, at when least considering the numerous runs in C-line and it's variants. These discs feature an amazing glide that will give you great distance even with slower arm speeds. Perfect for long anhyzers and tight wooded shots. This material glows in the dark. These discs represent the 2nd run ever made of the FD in Colour Glow material. For the most part, first runs were available solely on InnovaStore & Discmania Store Mystery boxes in late 2017. The FD is not offered in Colour Glow material in Discmania's stock selection, so don't miss this rare chance to get some! The Night Strike stamp design is incredible. It is displayed on the colour glow plastic and features a rattlesnake with images of the desert between its scales. It’s a true masterpiece and Nate Perkins could not be more thrilled. Perkins has been on tour for Team Discmania for the 2018 season and has had multiple podium finishes. Hurry and get yours now. Don’t be left as dust in the wind. Release 7. nov. 2018. Start din golf disc samling her! Limited ed. PD i C-line. This version is a soft champion plast. This is the preferred model of professional players.